Residents of the building at 22nd and Mission look on at burnt building. Photo by Daniel Hirsch. For many of the 65 residents who escaped the four-alarm fire that ripped through their homes at 22nd and Mission last week, the terrifying blaze seemed to come without warning. Suddenly, smoke, flames and screams filled the quiet hallways of their 108-year-old building. Many in the building report that they heard no alarm ring and no interior smoke detectors went off. In the case of smoke detectors, several tenants report, there were never any present in their apartments. The California Health and Safety Code states that a smoke detector be installed in “each dwelling intended for human occupancy.” It goes on to define a “dwelling unit” to include “dwelling unit of a multiple-unit dwelling complex.” The code also states that it is the building owner’s responsibility to test and maintain. The owner Hawk Lou, who was often around the building, has provided documentation indicating that the building had working emergency systems and had passed various inspections, though he wouldn’t comment specifically on smoke detectors. One of the building’s alarm had gone off at least once before in the summer of 2014. No one, however, heard it on the night of the fire. Jorge Gómez, who has lived in the building since 1996 at unit 223, described a similar scene. By the time he realized there was a fire, rescue crews were already inside the building. Gómez, who lived in one of the few apartments with an alarm—one he had installed himself—said firefighters were already inside when he learned a fire was tearing through the third floor. “The alarms inside my apartment worked, but the ones outside didn’t,” he said. In the case of one man, Mauricio Orellana, the lack of advance warning may have cost him his life. When firefighters found the 38-year-old in the small, closet-sized room he rented in a one-bedroom apartment on the third floor, he had already died of cardiac arrest. 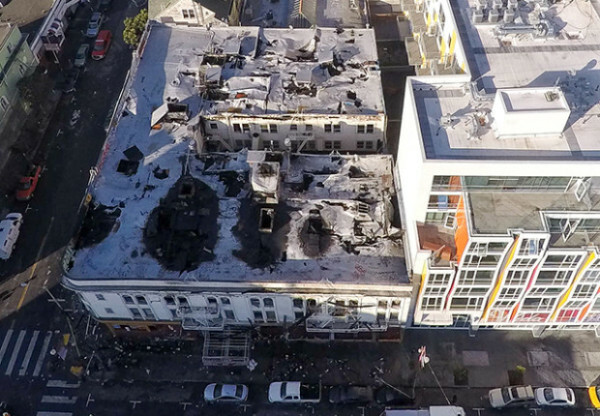 “The fact that so many people were trapped—at least seven on the fire escape and five trapped inside—indicates that there was no early warning,” said San Francisco Fire Department spokesperson Mindy Talmadge outside the charred building the day after the fire. Fire inspectors are still investigating the cause of the fire. 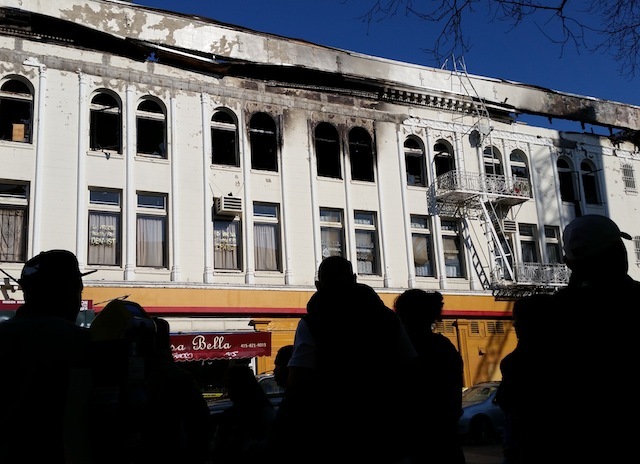 Hawk Lou, whose family has owned the building since 1990, shared a signed letter with Mission Local and other media outlets from fire marshall Michie Wong noting that the property passed a Fire Department inspection conducted in August 2014. He also shared a record of an alarm test conducted by Tom Jue and Company, a certified alarm testing company. The alarms, which are required to be tested annually, passed inspection exactly a year prior to the fire. The certification would have expired at midnight the night of last week’s fire. “As you can see from the fire marshal report and receipt, everything was maintained and in working condition,” Lou wrote to Mission Local in an email last week. If the building was indeed compliant, it is unclear why the flames and smoke failed to trigger the alarm, and why many tenants said they had no smoke detectors inside their units. Lou said that any bars in the apartments—put there to keep children from falling out—had a release latch. For whatever reason, sheer panic or a malfunctioning part, the bars on the window prevented Cordova from using them as an escape route that chaotic night. Drone photo by Eddie Codel. Tony Caro, another third floor resident who works for a building management company elsewhere, said he had no idea how the building ever passed any inspection because the apartments don’t have smoke detectors. However, several residents say that they never saw any smoke detectors in the building’s units. When asked about the discrepancy between Gil’s account and the accounts of many tenants, Caro said it was possible the inspectors only went into Gil’s place, which was in better shape than others. Like the fire department, Strawn said the building department only goes into individual units “when invited.” Its inspection consists of checking exit routes, the functionality of fire escapes, and determining if certificate are current on alarm systems and fire extinguishers only in a building’s common areas. It’s up to the landlord to maintain smoke detectors within units. The fire on Mission and 22nd Breaking Out from Mission Local on Vimeo. Public records show at least one complaint was filed with the fire department in June 2010 about issues with the building, stating “alarm system doesn’t work, and no fire extinguishers visible.” Records show inspectors came to the property multiple times that summer but were unable to enter the building. Strawn said that this complaint also triggered inspectors to visit the building in October 2010 and found that the fire extinguishers needed to be recharged. Once Lou responded to this violation, the Department of Building Inspection considered the property to be in compliance with code. “We like inspections to happen in roughly a three to five year period,” said Strawn. Given this time frame, the building would have been due for another walk through sometime in the next year. Lou would not comment on the smoke detectors, but regarding the building’s emergency alarms, he said they were present and had no issue. Mission Local can attest that during our time in the building they did go off at least once during the summer of 2014. “I want to emphasize the last time I walked by the alarm system panel, there were no warning lights on to say it was malfunctioning,” said Lou. From our own experience with Lou, he was a fairly consistent presence in the building. Though sometimes slow to respond, he was a far from an absentee owner. Built in 1907, the building was too old to be required to have sprinklers. It went through no major upgrades to trigger the required installation of such a system. By all accounts, the 65 residents who lived in one of the third floor’s 17 units or the one residential unit on the second floor, lived in cramped, intimate quarters. In some cases, there were multiple families per unit or a family of five living in a small studio. In the years that he owned the building, there were other complaints. A serious gas leak in the basement in 2007 prompted a visit from PG&E. The Department of Building Inspection received complaints filed by staffers at the Planning Department and Department of Public Health about water leakage, exposed wiring, and possible illegal construction. All of them were abated after a few months. Despite these issues—most originating from public employees and not tenants—there were surprisingly few complaints for a 108-year-old building. In a city filled with aging housing, the building at 22nd and Mission is not an uncommon one. In fact, it’s actually one of several buildings owned by Lou himself. How do Lou’s other buildings compare with the questionably maintained conditions at 22nd and Mission? Why weren’t more of his tenants willing to approach the city with their building’s apparent issues? We’ll try to answer these questions, and more, in the second part of our story to be published next week.